Breakfast is a meal that once was treasured by families, but now it is almost non-existent. Where families once sat down together before starting their day, has now turned into grabbing a breakfast bar before rushing out the door. In my home, our family still values the family breakfast time, even if it’s only a weekend occurrence. Since family breakfast time is limited, I enjoy making it extra special. I find that if I prepare food from my heart, that makes my family enjoy meal time together even more. That is why I put so much time and effort in creating the perfect creations for my family to enjoy. One of my favorite breakfast recipes to make is my Waffle Breakfast Casserole with Sweet Maple Bacon Syrup made with Petit Jean Hickory Smoked Bacon. It’s sweet, yet savory and is perfect for breakfast or brunch. And if you’re restricted on time, make ahead and bake when ready or omit the homemade waffles and use frozen waffles in it’s place. Grab some Petit Jean Hickory Smoked Bacon, and I promise this will become a family favorite casserole and syrup, for your next breakfast meal together. 2.) Cook Petit Jean Hickory Smoked Bacon in oven until it is perfected to your liking. 3.) While bacon is cooking, mix up your waffle batter and start cooking waffles in a waffle iron. 4.) Mix your eggs, cheese, milk, salt and pepper together in a separate bowl and set aside. 5.) Once your bacon is cooked, pat with a paper napkin and cut into ½ inch pieces and add to egg mixture. 6.) 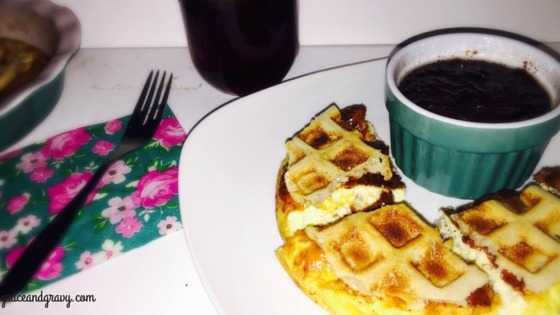 When waffles are finished, batter your round or square 8x8 pr 9x9 casserole dish and place 1 round or 4 square waffles in bottom of dish, next add ½ of your egg mixture, add another layer of waffles, add the remaining egg mixture and place the remaining waffles on top. 7.) Place in oven at 350 degrees for 20-25 minutes until your eggs are completely cooked. 8.) Serve warm with Sweet Bacon Maple Syrup. 10.) Cook your Petit Jean Hickory Smoked Bacon until perfected to your liking. 11.) Bring your water to a boil. 12.) While water is heating up, cut your bacon into ½ inch pieces. 13.) Turn heat down to medium, add sugar and whisk until dissolved. 14.) Once sugar is dissolved, add your corn syrup and Petit Jean Hickory Smoked Bacon and stir for 4-5 minutes. 15.) Turn off heat, add your vanilla and maple extract and whisk for appx 1 minute. 16.) Pour desired amount over casserole and store remainder in the refrigerator.